Last weekend we ran SteamCon US in Nashville Tennessee and had an absolute blast! 200 excited Guild Ball and Godtear fans (click here to see the Godtear Reveals) descended upon the Gaylord Opryland Convention Centre to soak up the atmosphere of SteamCon, play an enormous amount of games, and spend time with the Steamforged Games staff. Alex Botts was once again crowned as the US (East) Guild Ball Champion, so Alex will be travelling to SteamCon UK in just a few weeks’ time to play in the Guild Ball World Championship Finals! On the Saturday night everyone gathered around to see the SteamCon US Keynote, hosted by the Steamforged Games development team, where we showed off some of the shiny new toys coming your way next year. We’re approaching the half way point in the Free Cities Draft and the Guilds are starting to work out which Rookies they really want. The only problem is that every Rookie is wanted by a number of Guilds! If you want to see the most up to date information on the Free Cities Draft, you can find it HERE. Be sure to check back tomorrow to see how the story has been influenced after SteamCon USA. The last time we saw Greede, he and Avarisse had just decided to part ways. This left Greede and Strongbox as the last surviving members of the Union. After some soul searching and a typical stroke of genius, Greede decided to take up Strongbox as his mount and start the Union off again on his own! When we reviewed our older organised play kits, we noticed that it didn’t take very long for them to become outdated. The alternative background chibi player cards and limited edition Mist sculpt were soon owned by almost everyone that attended regular Guild Ball events. So these kits very quickly dropped off in value for our fans. For our brand new Guild Ball organised play kit we’ve changed things up a little. We’ve had four brand new alternate sculpts made for the new kit. We’re also not necessarily recommending Tournament Organisers give these sculpts away to first place. That’s certainly an option, but it’s worth considering whether you want to give them away to someone else instead; like last place, best painted, or most sporting, to give some ideas. In each organised play kit there will be a small, blacked-out, sealed bag containing one of these four alternate sculpts, chosen at random. This should mean that it will take fans a while to get hold of the sculpt they want, meaning that the organised play kit will be more important to fans for a longer period of time. What’s better is, when these alternate sculpts have been ‘in the wild’ for long enough, we can just replace them with new ones! In a few weeks time at SteamCon UK, we’ll be previewing the final two blind alternate sculpts. One will be another ‘common’ sculpt, and the second will be a ‘super rare’ sculpt, oooooh! Guild Ball Design a Model, Minor Guild Edition! This year we took the seminar in a slightly new direction. This time we explained our concept for a brand new Minor Guild, allied with the Brewers, the Entertainer’s Guild! The Entertainers are a collection of stage actors who play the role of a series of myths and legends from the Guild Ball world. Guided by Steamforged Games developers Sherwin Matthews, Jamie Perkins, and Steve Margetson, this year’s seminar attendees created ‘Kid Blackhearrrt’. A young player of a similar years to Boiler, who is still at the age where pirates are funny and cool, completely unaware of the horrors that real pirates inflict on the world. Complete with a mask, wooden sword, and ‘Coin sock puppet’, SFG sculptor Ben Charles quickly threw together this work in progress render which we presented during the Keynote. In a few weeks at SteamCon UK, the attendees there will have their own chance to design a model for the Entertainer’s Minor Guild! Wait… Hang On… a Minor ‘Miner’sGuild’? REALLY? Yep! Our headline reveal from the SteamCon US Keynote was the Engineer’s Minor Guild, the Miner’s Guild! The Miner’s Guild are a group of hardy, dirty, working men & women who do have an incredibly dangerous day job, in addition to playing Guild Ball! Years spent working underground in hazardous conditions has led to all of them having one or more mechanical prosthetic limbs, which serves as the main visual feature for this Guild. Firstly, we revealed the Guild’s Captain, Shaft. The Miners are experts at using explosives that can seriously disrupt the positioning of enemies. Speaking of explosives experts, we also revealed the Miner’s Squaddie, Fuse. Similar to the Engineer’s Guild, the Miners bring their own flavour of mechanica with them. These are filthy and overworked machines, cobbled together with patchwork repairs to give them a look which is distinctive from the mechanica belonging to the Engineers. To this end, we also revealed the Miner’s Squaddie, Mule. 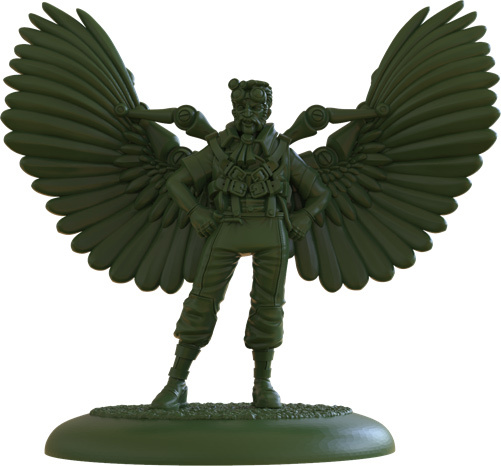 Finally, we also revealed an alternative sculpt for the Engineer’s Squaddie Colossus, who will be one of the two models to become ‘Dual Guild’, meaning that he will be able to play for either the Engineer’s Guild or the Miner’s Guild. The Miner’s Guild will focus quite heavily on scoring goals, and be one of our more resilient teams in the game. Similarly to the Engineer’s Guild in this respect, it will be more difficult to inflict take outs on the Miners than it is to most Guilds. The Miner’s Guild will have more ‘place’ effects than any other Guild in the game. Place effects are the Guild Ball equivalent of teleporting. This represents the Miner’s literally digging under the pitch and reappearing somewhere else. Finally, we will be doing everything we possibly can to ensure that the Miner’s Guild playstyle and rules are streamlined enough to be considered beginner friendly, making them an ideal team to get started playing Guild Ball with. That’s all we have for today folks! Join us again soon to see our finalised schedule of events for SteamCon UK. In the meantime, keep calm and play Guild Ball!